Rigid earth retaining structures are common civil engineering structures and they are constructed to retain the backfill soil. The evaluation of lateral earth pressure on retaining walls under due to retaining soil and external loads during the service life is vital as it significantly influences the cost of the project. Lateral earth thrust on rigid retaining walls from the backfill can be minimized by a suitable technique, notably using lightweight backfill, placing a compressible inclusion between the backfill and the retaining wall, or by providing one or more relief shelves along the height of the wall. 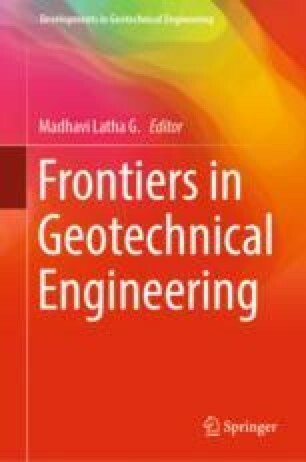 This paper discusses recent studies carried out at IIT Bombay to reduce long-term lateral thrust on rigid retaining walls retaining cohesionless backfill using compressible geo-inclusion. The laboratory studies on geofoam samples reveal that Young’s modulus, yield stress, and compressible strength of the geofoam reduces with time. Also, the estimated creep strains obtained from Time–Temperature–Stress Superposition (TTSS) accelerated creep testing method at the end of 100 years was in the range of 2.1–2.4%. The isolation efficiency of the geofoam, which is defined as the ratio of reduction of lateral thrust due to the provision of geofoam at the soil–wall interface and the lateral thrust without geofoam, obtained from pseudo-long-term studies was more compared to that of short-term studies by 2.4–8.1%. The studies, for the first time, reveal that geofoam inclusion considerably reduces the lateral thrust on the wall not only in short-term but in long-term as well.